Would you consider NOT re-signing Perez? Baku was clumsy by Ocon, Today from Perez I believe was intentional and 100% dangerous. It's almost grounds for an instant firing but I would let him see out the season and see how it goes. It's clear to me that their relationship isn't going to work and Force India definitely need to pick one of them for the future. They could try and ' control ' both of them but ultimately I don't see this as a real option. I think they both won't listen. Last edited by jasonthebadger on Mon Aug 28, 2017 9:27 am, edited 1 time in total. Perez is a very good driver and brings a lot of money to the team. They're still better off with him than without and getting rid of him is too much of a knee-jerk reaction in my view. Sadly it's time for team orders I think. If they can't race each other respectfully then the best thing for the team is that they shouldn't. Both have been linked with the second Renault seat I believe so the problem may solve itself. If Force India do instill TO from Monza onwards, Do you think that Ocon and Perez will respect them? One of the problems for Force India is that their car is almost in it's own league, Renault seem to be catching and Williams is either on or off depending on the track but 50% of the time they are battling each other. I can't see them co-exist together in 2018. Let Perez go to Renault as it looks as if he's getting insecure by Ocon. The only solid way to do it is to make one of them team leader. Which one, I would not like to say. Yeah I heard Otmar saying that in the race, I just can't see either Perez nor Ocon actually obeying them. It's a tough choice too, Choosing which driver to favour, even alternating with each race may not work, albeit being the fairest option. Perez has an Ego problem, last few races Ocon has been close if not faster than him, this is bad for Perez, being beat by a rookie, Force India has a new top driver and its not Perez. Yeah. Perez has always been comfy when dominating his team-mate. He knows Ocon is matching him & will eventually beat him. Perez's behavior is sad to be frank. He's killed his chances forever to go to any top team. I wonder if he's signed with Renault & doesn't care a damn for Ocon now. I thought Renault were giving Palmer till the end of the season to prove himself? ( I know, probably PR speak ). I wonder what effect this race has had on his stocks? Although I'd agree that Perez and Hulk have proven to be able to race fairly against each other. I said signed with Renault for 2018. The reason why he & Hulk got around well was because Perez used to mainly dominate Hulk. Even if Hulk would be in a position to be side by side or pass Perez, Hulk would prefer being safe than sorry. That's the reason for his consistency. Impose team orders with (if contractually possible) the threat of instant firing/suspension if one of them clearly ignores them. Last edited by jasonthebadger on Sun Aug 27, 2017 2:48 pm, edited 2 times in total. As per Otmar, they won't be racing against each other anymore. This means whoever leads into the 1st corner, will be the no. 1 driver or they will try different strategies with them so that they don't clash. Team orders should've come into the picture after Baku. Pere'z contract not been signed yet does raise some eyebrows. I wonder if he's leaving FI for Renault / Williams? If he's leaving, he becomes complacent with his team-mate. I think firing him would be knee jerk, with his contract unsigned though I would certainly be looking elsewhere as far as hiring for next season is concerned. Correct, perez out performed hulk in that time so there wasnt a inter team battle for positions and if they were together hulk would let him by no problem for the best team result..
Its clear to me imo that perez closed the door on ocon for no reason at all. Whats sad is that if they worked together they could double team the field and get better team results. Look at how hard he defended in Canada, compared to his non existent defence against Vettel. Perez pays Otmar's salary, so he basically works for him, not the other way round. I'm sure Perez would be quick to remind him of that. Perez to Williams, Wehrlein to FI, Leclerc to Sauber. I think Perez has been found out a little this year. He's a great deliver, I just think he can't deal with pressure from his team mate. He'll move on after this year I think. Williams seems like a good fit. I think his chance at Ferrari has gone, if he ever had one. Yeah I don't think he's a great driver. He's a solid driver and can stretch the tires. That's his only trick. His other trick is to be an obstinate donkey. No wonder Mclaren dumped him after only one year. He is not a big team material, never was and never will be. He comes way to arrogant in his interviews even having malicious stereotypes at times. Perez has been behaving like a spoilt child but I think it's pushing it to say he has been "found out" by Ocon. He almost always has the beating of Ocon and he didn't of Hulkenberg. His comments about this incident makes no sense either TBH. I do think this is a problem teams have if they allow drivers to fund them. Obviously if they're paying for the whole shebang they are going to be entitled. I think Perez's time at FI has come to an end. He's still a very good driver and would slot in at Renault or Williams perfectly. Well said. It's fair to say that Perez has not, in the past, and will not, in the future, respect team orders. IT's also reasonable to suspect that FI is not that good or comfortable at giving clear instructions to the drivers during the race. "Let him by NOW please!.". Given the millions of pounds, euros and dollars that have been piddled away by the teams inability to control the drivers and the drivers inability to control themselves, there needs to be a drastic change made. I vote, give Perez the sack now. He could have killed Ocon today and had a go at it twice ffs. Clearly Massa's not a fan of Perez. And now, let the back peddling being. What a sorry sod. I disagree with what he is saying but I see no back peddling? I do find his attitude RE this incident appalling. He should really just hold his hands up and say I made a mistake. How he didn't get penalised for it defies belief. Particularly when the stewards were being quite visible and handing out penalties in this race, such as Kimi's somewhat activist (in my opinion) penalty. I think it's because the Hulk was both older and well respected when Perez first joined Force India so just matching the Hulk would reflect well on him, however having problems against a rookie driver who is 7 years younger all of a sudden starts to make Perez look like yesterday's news. The problem actually started before that in Canada when Perez was holding Ocon up and wouldn't let him through as suggested by his team although not ordered to do so, what he actually ended up doing was to start to defend against Ocon in a aggressive manner. It's hard to fire a driver who is basically a cash cow for the team. It was pretty obvious onboard with Ocon that the door was always going to be shut on him, yet he persisted and the contact was made. Ocon got too greedy and should have instead taken Perez easily on the following straight under DRS, Perez ideally should have left more room for his team mate but at the end of the day he is allowed to defend his position. As for Force India there is obvious tension between the two drivers and in the end it's costing them big points, they can no longer be trusted to race each other cleanly and the team should start imposing team orders to put an end to this mess. Quite so. But that being said, Perez should have left more room for a teammate, even if the move was over-optimistic. As you say, Ocon was always going to get by on the straight - why fight him so hard, putting both cars in danger? Ironically probably because Perez didn't trust Ocon to make it cleanly through Eau Rouge thus squeezed him to make sure he wouldn't try it, if you had the choice would you rather have contact on the lead up or in the middle of Eau Rouge? Perez did overtake a few cars yesterday & all were clean. When it came to defending against Ocon, it wasn't clean. I know overtaking & defending are 2 different things here but I had a strong hunch that if either of them were to try overtaking the other, there would be a contact. The contact that they had on the 1st lap in the same place seemed even bigger but they should've learnt their lesson there & been more careful. As per the screenshot posted above, no doubt there is no room for Ocon to pass but Perez should've kept some room. I'm sure had there been some other driver, Checo would've kept some room. He has this grudge against Ocon & he showed it. BTW, Ocon should've waited for Kemmel Straight to make the pass. But had Checo done something similar on the straight, the outcome could've been far worse due to greater speed there. Perez is a known quality, and I have been calling him "Thou Shall not Pass" Perez for years because the man will do whatever is possible to deny anyone getting past him. It is nice for any driver to have a combative nature, but Perez is color-blind, he will deny anyone, no matter what livery. 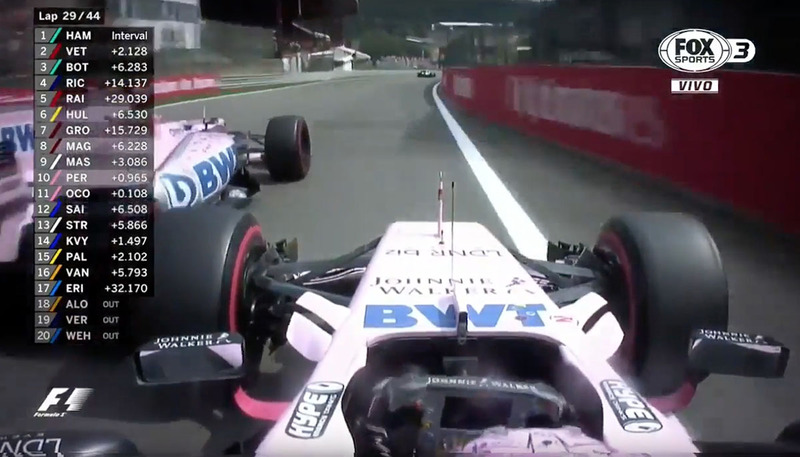 IMO it did not matter where Ocon tried to go around Perez, a block was a certainty. He had a run, tried for a gap, Perez closed it. So what do Force India do for the remainder of this season? As mentioned, from this race froward the team will call everything, both drivers have been neutered. That will solve the problem for 2017, but after that the team had a lot of mighty decisions to make. They made a decision a few years ago,and now are without any denial the "rest of the best". Do Force India strive to improve even more, strive to break into the top three? If they have aspirations, then the team must pry open more funding, and also find a top tier driver. Those are the most pressing issues, and the fate of Perez and Ocon follow after these decisions are made. I wonder if Perez has become more callous for a reson. Could that reason be he's leaving Force India at the end of this season? No doubt he's feeling pressure from Ocon. He can't take this for 1 more year in 2018, where I'm sure Ocon would even grow stronger in race pace. perez would sit next race out. ocon would sit out the race after that, if i owned the team. So the poll gives us no option on Ocon. Very fair. I am very worried about these new guys. Ocon, Verstappen, Kvyat, sometimes Sainz. It seems that they can not comprehend the potential danger of some of their antics. Ocon and Verstappen have been involved too many times now in high speed accidents to make me think it's characteristic to this new generation. I have watched the previous generation(Hamilton, Vettel) start their F1 careers and I don't remember them being this aggressive or involved in potentially "fatal" accidents. Ocon yesterday had newer tyres and would have passed Perez on the Kemmel straight. What he did yesterday was even dumber than Perez dangerous driving. If nothing changes, these new guys will cause a big one somewhere, no doubt about it. Maybe too much videogaming(Ocon is another videogame nerd just like Verstappen), or just a case of too much too soon? A 20 - 21 year old limit should have been enforced by the FIA many years ago. Too late now.